How do you make sure you’re hitting the widest possible audience out there? Are you employing a wide variety of tactics? Email marketing? PPC adverts? Content marketing? What about influencer marketing? Have you considered that? Influencer marketing taps into our tendency to trust the recommendations of those we admire. We trust recommendations from family members. If they’ve bought a product they’re in love with, it’s likely that you’ll consider buying it too. This phenomenon has been noted over and over, many marketers have read it at least once. Jonah Berger’s ‘Contagious’ has a whole chapter dedicated to this! Influencer marketing makes us feel like we’re in on a secret. In reality, it’s widespread word of mouth marketing, and brands are tapping into this every day. It’s a win, win for brands and influential creators; the brands get exposure, the creators get money, and a connection to the brand’s existing fan base. For this reason, and others, upcoming bloggers and journalists are keen to position themselves as influencers. YouTube is a favourite platform for many of these creators, and it’s easy to see why. 300 hours of content is uploaded every minute, 3.25 billion hours of content are watched every month. Now, 6 out 10 people say that they prefer online video platforms (such as YouTube) to live TV! Popular predictions say that the use of influencer marketing will become even more prevalent in 2018; but recent changes to YouTube’s Partner Program are shaking things up. Smaller creators are feeling threatened and ignored, and bringing recently forgotten drama back to the fore. Because of all this, it’s uncertain how these changes are going to affect this burgeoning sub-section of brand marketing, and its future. The changes (in a nutshell) have increased how many hours of watch time and numbers of subscribers YouTube creators must have in order to qualify for the partner programme. The big creators are safe, but the smaller creators, the up and comers… they’ve been hit hard, and they’re angry. They believe that the changes are stifling smaller creators, and making it harder to gain a name as a ‘big time’ YouTuber. The eligibility requirements are currently set as creators needing to have a minimum of 10,000 lifetime views. Under the new system, creators must have a minimum of 1000 subscribers and 4,000 hours of watch time within the last 12 months. One of the major complaints is that creators who currently qualify for the Partner Program are not protected by these changes. Now, they must reach the new requirements by February 20th 2018, or be kicked out of the Partner Program until they reach the new minimum watch times/subscriber numbers. For brands, this can be interpreted as either a good or bad thing. On the plus side, their paid adverts will only be shown before videos made by creators proven to have higher watch times. On the downside, there will now be fewer videos which are eligible to have adverts put before them — so competition for placement will increase to a degree. For brands which are implementing influencer marketing the are more issues to consider. Larger influencers are likely to be inundated with more influencer marketing requests, and working with smaller influencers may lose its appeal because they’re not included within the ‘new’ YouTube Partner Program guidelines. In a particularly poorly judged video, Logan and his team film and show a still hanging, dead body in Japan’s ‘Suicide Forest’. The body was even featured in the video’s thumbnail.There are arguments everywhere about whether his laughter in the video was out of poor taste, or caused by shock. Initially, there was no reaction from YouTube, not until the mass public outcry got to them. It was Logan Paul’s people who took down the video, not YouTube. In fact, at the time they removed it, it was all over the YouTube Trending page. Since the controversy, YouTube has cut almost all ties with Logan Paul, but his page is still live, and still eligible for monetisation — which incurred the wrath of smaller creators, again. The question they’re asking is, why is Logan still able to make money from the platform after creating inflammatory content? The new Partner Program thresholds just don’t count for taste. 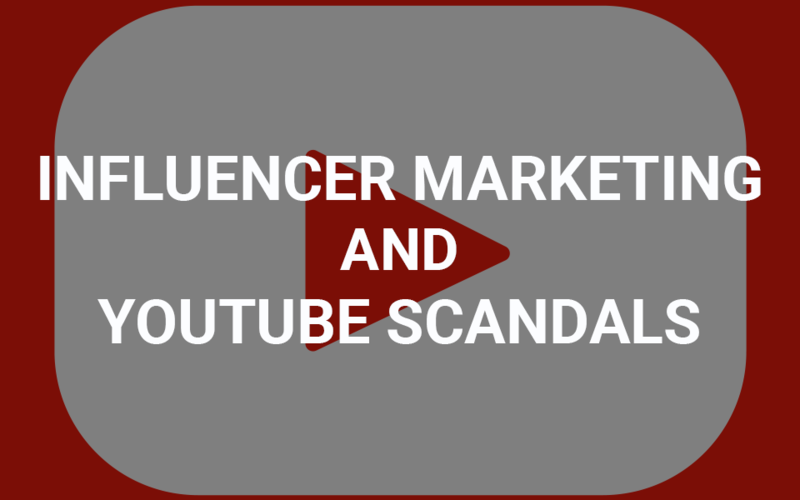 So with all of this going on, YouTube (and influencer marketing on YouTube) is in flux. Competition is up, moral is down, and honestly there’s no guarantee that the scandals are over. The thing is, YouTube isn’t the only platform for influencer marketing. Influencers generally have their own platforms (blogs) and they’re present on social media. This means that you can still tap into your influencer’s audience. Additionally, through ‘discovery’ searches and paid advertising, you can still reach new audiences. Expert predictions say that influencer marketing is going to be bigger than ever in 2018. With all of this drama it’ll be interesting to see if this actually happens. Be sure to let us know what your take on the whole situation is. The conversation matters, both for advertisers and creators, and we’d love to know what you think.